Within their application, they include proposed drawings for the space. The renderings are of a restaurant that includes a kitchen, bar, dining area, and a private event/dining space. Rhinegeist declined to comment or provide any further details on the space, saying they are not yet ready to make a detailed announcement. This development follows a flurry of investments that Rhinegeist has made since opening in June of 2013. Rhinegeist then invested $10 million to expand operations. This included the purchase of their building from Orton Development for $4.2 million in November of 2014, new brewing equipment in early 2015, and the 4,500 square foot deck that opened in 2016. The new production equipment enabled them to triple production from 11,000 barrels in 2014, the first full year of operation, to 31,000 barrels in 2015. 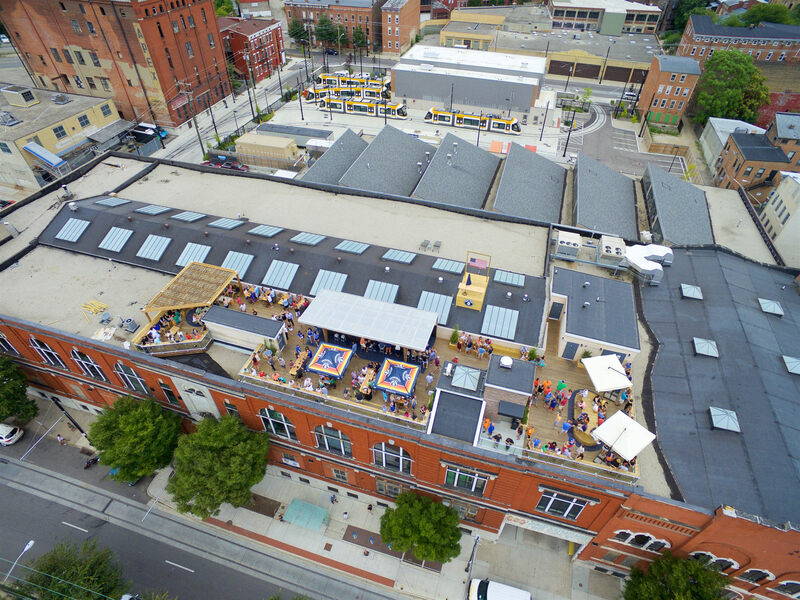 Rhinegeist also built an almost 8,000 square foot private event space in 2015 that began holding weddings and other events in September of 2015. Besides changes made inside the building, several assets have been added outside of Rhinegeist since their opening in 2013. In 2014, Rhinegeist was the first business to pledge funding for streetcar operations at $5,000 per year. The Brewery District stop for the Cincinnati Bell Connector, which began operations in September earlier this year, is located just outside of Rhinegeist’s entrance. In addition to the streetcar stop, Cincy Red Bike also opened a station outside of Rhinegeist’s entrance in July of this year. Additionally, ArtWorks completed a mural outside the brewery last month.